Full atomistic molecular dynamics simulation of a high-resolution HPAA-collagen structure constructed to investigate the effect of the presence of large polyelectrolyte molecules along the surface of collagen fibril on the movement and infiltration of ions in a biomimetic model. Credit: Science Advances, doi: 10.1126/sciadv.aav9075. Living organisms form biological minerals during biomineralization, where inorganic elements can selectively deposit on specific organic macromolecules under precise control. The process can be divided into biocalcification or biosilicification based on the inorganic component, with collagen used as a universal template. During intrafibrillar mineralization, collagen matrices that are destined for mineralization in vertebrates contain surface bound matrix proteins. Understanding the complex mechanisms of intrafibrillar mineralization to form hard collagenous tissue such as bone and dentin is of significant interest in biomechanics, with decades of studies conducted to mimic or model the process in lab. In a recent study, now published in Science Advances, Q. Song and co-workers at the interdisciplinary Departments of Biology, Applied Physics, Materials Science and Engineering, Biomedical Sciences and Dental Medicine, in China, the U.S. and Italy, have developed a biomechanical model to examine the collagen-ligand interactions contributing to intrafibrillar mineralization. In the study, they used negatively charged, high molecular weight polycarboxylic acid, cross-linked to reconstituted collagen, to create the biomimetic model. 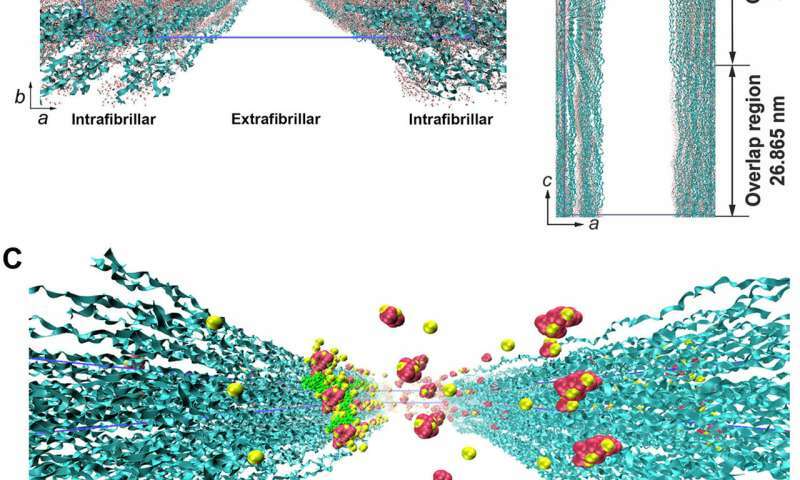 They conducted cryogenic electron microscopy and molecular dynamics simulations, to show that chain-like aggregates formed after cross-linking to collagen, along the fibrillar surface to implement fibrillar mineralization. They observed that the negatively charged, mineralized scaffolds allowed them to achieve higher quality with better biomechanical properties, compared with mineralization on unmodified scaffolds. The work on collagen-ligand interaction provided the scientists with insights on the origin of heterogeneously mineralized tissues and also clarified the potential causes of ectopic calcification (inappropriate biomineralization) in nonmineralized body tissues. Biominerals that occur in nature inherently contain calcium to form calcium phosphate (CaP) and octacalcium phosphate as examples. CaP-containing biominerals specifically constitute vertebral hard connective tissues, whereas calcium carbonate forms the invertebral skeleton. Collagen fibrils can be used as mineralization templates due to nanoscale channels in their fibrillar structures to form nanoengineered hybrids with combined strength and resilience. However, the process cannot be achieved by simply immersing collagen matrices in a supersaturated solution of mineral ions, instead requiring the use of nucleation inhibitors to stabilize ion association complexes and prevent their crystallization outside the fibrils. As a result, in the last decade, scientists have proposed different in vitro models to understand the mechanisms of intrafibrillar mineralization. In the preceding study models, inhibitors of crystal nucleation were included in the mineralization medium and not bound on to the collagen fibrils, departing from the typical scenario that occurred in biological systems. In the present study model, Song et al. therefore allowed the inhibitors to bind the collagen fibrils for adequate biomimicry. Characterization of PAA-collagen. (A) Infrared spectra of PAA-collagen sponges. Spectra were normalized along the collagen amide A peak (~3300 cm−1, NH stretch coupled with hydrogen bond) Compared to the spectrum of bare collagen, the spectra of HPAA-bound collagen (HPAA-collagen) and LPAA-bound collagen (LPAA-collagen) sponges show increases in the amide B, I, II, and III peaks. (B) Solid surface ζ potential of HPAA-collagen, LPAA-collagen, and bare collagen. Cross-linking of PAA to the collagen molecule resulted in significantly lower ζ potentials of −17.17 ± 1.98 mV for HPAA-collagen, −15.19 ± 1.22 mV for LPAA-collagen, and −3.04 ± 0.37 mV for bare collagen. (C and D) Comparison of carboxyl (C) and amine groups (D) between PAA-collagen and bare collagen. After anionic modification, the quantities of carboxyl group (in mM/g of collagen) in the HPAA-collagen (1.907 ± 0.084) and LPAA-collagen (1.807 ± 0.035) were significantly higher than that of the bare collagen (0.460 ± 0.017). Credit: Science Advances, doi: 10.1126/sciadv.aav9075. Since physiological noncollagenous proteins are difficult to extract and functionally complex for use in biomimetic mineralization studies, Song et al. used anionic polyelectrolytes as nucleation inhibitors in their model of intrafibrillar mineralization. Anionic polyelectrolytes can mimic the highly anionic and intrinsically disordered protein conformation found in noncollagenous proteins. In the proposed model, the polyelectrolyte nucleation inhibitors bound to the matrix protein-free reconstituted collagen as models of intrafibrillar mineralization. Song et al. first simulated the molecular dynamics to show that a polyelectrolyte such as polyacrylic acid (PAA) could reserve calcium and hydrogen phosphate ion complexes into chain-like aggregates along the surface of the macromolecule upon its introduction into a supersaturated CaP mineralization medium. Based on the simulated molecular dynamics, Song et al. developed a testing hypothesis that a nucleation inhibitor bound to the surface of collagen fibrils could stabilize CaP mineralization precursors near the fibrils, for efficient intrafibrillar mineralization. To test the hypothesis, they used controls with an unbound version of the same polyelectrolyte used to stabilize the CaP precursors included into the mineralization medium instead. Simulating the late phase of intrafibrillar mineralization of HPAA-collagen. 3D rendering of the late phase of intrafibrillar mineralization of HPAA-collagen showing accumulation of prenucleation cluster aggregates (yellow) along the fibril surface; intrafibrillar minerals are depicted in orange. Credit: Science Advances, doi: 10.1126/sciadv.aav9075. The scientists used high-molecular weight polyacrylic acid - PAA (HPAA) to simulate osteopontin and low molecular weight PAA (LPAA) to simulate osteocalcin. They chemically crosslinked the polyanionic electrolytes to reconstitute type I collagen fibrils or sponges using organic compounds and examined the polymer constitution using Fourier transform infrared spectroscopy (FTIR). Song et al. used transmission electron microscopy (TEM) to observe PAA-bound collagen fibrils that were stained red and recorded them as electron dense filamentous aggregates on the fibril surface. They then used high-performance liquid chromatography to examine the characteristics of binding/release of PAA-collagen sponges. 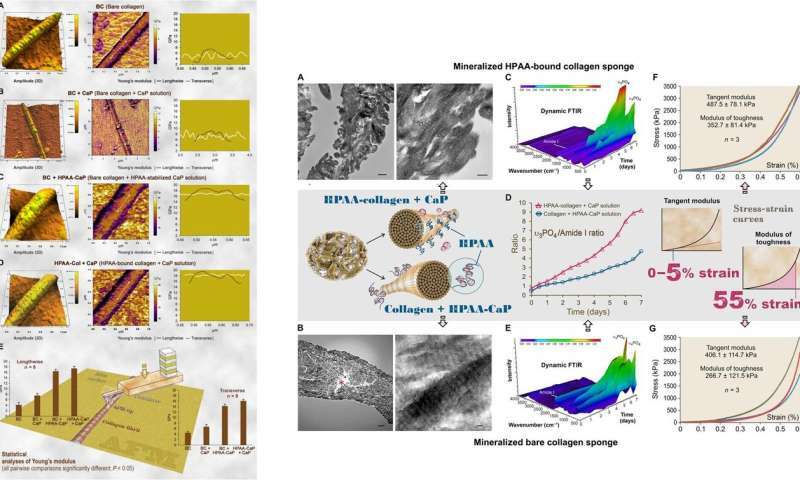 To understand the different phases of intrafibrillar mineralization of HPAA-bound collagen (HPAA-collagen), the scientists created movies using the electron tomography data of the diverse phases of biomineralization. They simulated the (1) early phase—to show the accumulation of prenucleation cluster aggregates around the unmineralized collagen fibril, (2) mid phase—to show partial intrafibrillar mineralization and (3) late phase - to show heavy intrafibrillar mineralization of the HPAA-collagen fibrils. 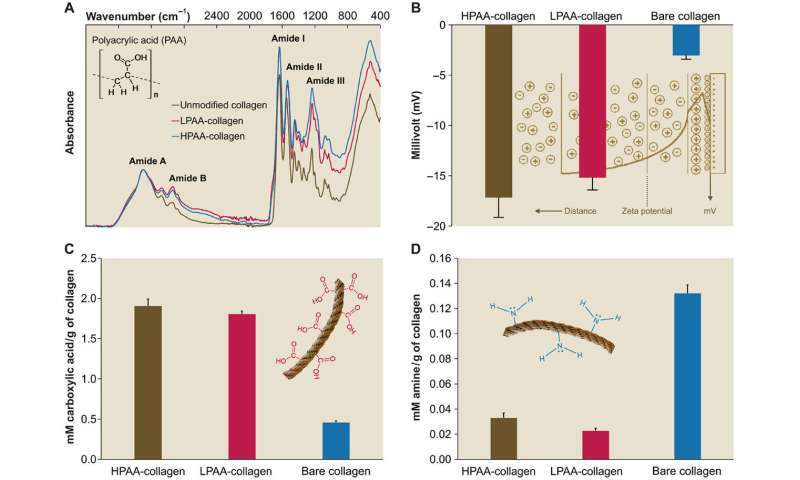 They showed that LPAA-collagen did not induce intrafibrillar mineralization compared to HPAA in the study, and therefore did not include the polymers in the subsequent experiments. Molecular dynamics simulations. (A) Profile of bare collagen microfibrillar structures with water molecules within the intrafibrillar spaces. Blue ribbons, collagen triple helices; red dots, water molecules. (B) Side view of bare collagen microfibrils. The blue lines describe the 67-nm-long simulation box. (C and D) Movement of Ca2+ (yellow spheres), HPO42− (red assemblies), and assembled CaP mineralization precursors (yellow-red assemblies) across the collagen microfibrils with the HPAA (green chain) bound to the LYS1099 amino acids of the collagen molecules. (E) Top: Simulation of the movement of various ions across the HPAA-collagen microfibrillar structures at designated simulation times. Blue spheres, purple spheres, yellow spheres, red assembly, yellow-red assemblies, and green chain structure represent Na+ ions, Cl− ions, Ca2+ ions, HPO42− ions, CaP mineralization precursors, and HPAA, respectively. Bottom: Dynamic changes in the number of Ca2+ (black line), HPO42− (red line), Na+ (green line), and Cl− (blue line) in the intrafibrillar and extrafibrillar regions along the a-axis boundary at 0, 30, 50, and 70 ns. (F) Movement of Ca2+, HPO42−, and assembled CaP mineralization precursors across the bare collagen microfibrils with unbound HPAA in the extrafibrillar region (control). (G) Comparison of the distribution of various ions within the intrafibrillar region in the collagen-bound HPAA and the unbound HPAA mineralization models. (H) Comparison of root mean square deviation of collagen molecules in the collagen-bound HPAA and the unbound HPAA models. (I) Comparison of solvent-accessible surface area (SASA) of the collagen molecules between the two models. Credit: Science Advances, doi: 10.1126/sciadv.aav9075. Song et al. thereafter used molecular dynamics simulations of the mineralization process to understand the structure-to-function relationship and validated the ability of collagen-bound HPAA to aggregate CaP mineralization precursors. For this, they used a full atomistic model of the hydrated HPAA-collagen fibril complex. In the unit model, they simulated Ca2+ and HPO42- ions and assembled CaP mineralization precursors to form around the collagen-bound HPAA. The work revealed the distribution of sodium ions, chloride, calcium and HPO42- ions along the axis of the unit model boundary. For ultrastructural examinations of the biomimetic model, Song et al. used nanoindentation to assess the Young's moduli of mineralized and unmineralized collagen fibrils with atomic force microscopy (AFM). The values were similar to those previously reported for mineralized and unmineralized fibrils, computed using nanoindentation. The scientists used X-ray diffraction spectroscopy to identify the presence of apatite on the mineralized sponges. The study showed that HPAA-collagen mineralized in CaP solution for seven days had higher mineral content than bare collagen. When Song et al. calculated the apatite/collagen ratio in the spectroscopic profiles, the HPAA-collagen sponges indicated higher levels of mineralization. : LEFT: AFM of the 3D surface topography and modulus of elasticity (Young’s modulus) mapping of representative air-dried, mineralized bare collagen and HPAA-collagen fibrils. (A) Bare collagen fibrils (BC) had a close-to-normal distribution of Young’s modulus transversely across the fibril. (B) Bare collagen mineralized in CaP solution without nucleation inhibitor (BC + CaP). (C) Bare collagen mineralized with HPAA-CaP solution (BC + HPAA-CaP). (D) HPAA-collagen mineralized with CaP solution without nucleation inhibitor (HPAA-Col + CaP). (E) Statistical analyses of the Young’s modulus of collagen fibril in the lengthwise and transverse directions (n = 8). RIGHT: Characterization of mineralized HPAA-collagen sponges and bare collagen sponges. (A) TEM of mineralized HPAA-collagen sponges. (B) TEM of mineralized bare collagen sponges. (C) Dynamic attenuated total reflection (ATR)–FTIR shows progressive mineralization of an HPAA-collagen sponge at 12-hour intervals over a 7-day period. (D) Changes in apatite υ3PO4/collagen amide I ratio of mineralized anionic collagen sponges and unmodified collagen sponges. E) Dynamic ATR-FTIR shows the progress of mineralization of a bare collagen sponge in HPAA-CaP solution. (F) Stress-strain response of mineralized HPAA-collagen sponges for determining tangent modulus and modulus of toughness (inset, middle row). (G) Stress-strain response of mineralized bare collagen sponges. Credit: Science Advances, doi: 10.1126/sciadv.aav9075. The modulus of toughness, which typically indicates the energy per unit volume that a material can absorb before rupturing, was also significantly higher for HPAA-collagen sponges indicating fracture resistance of the material. Such features account for the high resilience of biomineralized collagen-based tissues that mimic bone microarchitecture to combine the bone properties of toughness and strength in regenerative engineering. Song et al. credited the observed properties of cohesive/adhesion to HPAA crosslinking, which allowed to create the collagen/mineral composite, similar to the crosslinked osteopontin found in bone architecture. Since the biocompatibility of new materials is an important feature in materials science and bioengineering, Song et al. verified favorable cell-material interactions on HPAA-crosslinked collagen using stem cell viability and proliferation during in-lab bone regeneration cell culture. When the scientists conducted mitochondrial dehydrogenase and apoptosis assays on human mesenchymal stem cells, they did not observe significant differences between the unmineralized HPAA-collagen and bare collagen sponges. Due to their compatibility to human osteoblast-like cells, such materials can be used as biocompatible coatings for surgical implants. In this way, Song et al. demonstrated a biomechanical model of intrafibrillar mineralization enhancement using collagen-ligand interactions to understand the site-specific mechanisms. This model of collagen-ligand interactions can also shed light on the potential causes of ectopic mineralization, which is of interest at present. In the perspective of Song et al., intrafibrillar mineralization via collagen-ligand interactions can infiltrate minerals more consistently into bulk collagen matrices for applications in regenerative medicine. The results will help understand the biomechanical properties, while reducing flaws to increase the biomimetic features of a mineralized collagen matrix in tissue engineering.